Where can I get semolina? This is quick cooking, and I can do this in 10 minutes. It’s a great dish but I’m not familiar with other ingredients so maybe I need your help. I think you can add some mayonnaise, there would be a twist on the taste! I got all the ingredients from an Indian Store.Semolina is also known as Farina or Cream of Wheat. I think you should get it the cereal section of any grocery store. Chick Pea is flour is also know as Garbanzo bean flour.If you don’t you get these you can skip it and just use Rice Flour. You can skip the other spice powders as well and just use curry powder and paprika which you would get in any grocery store….the taste won’t change much. I have never tried it with Mayo, but I think it will make it soggy. Easy to make, but yet delicious! Thanks for sharing. Glad you liked it..Thankyou !!! I am glad you liked the recipe. I have not tried this recipe with other vegetables. 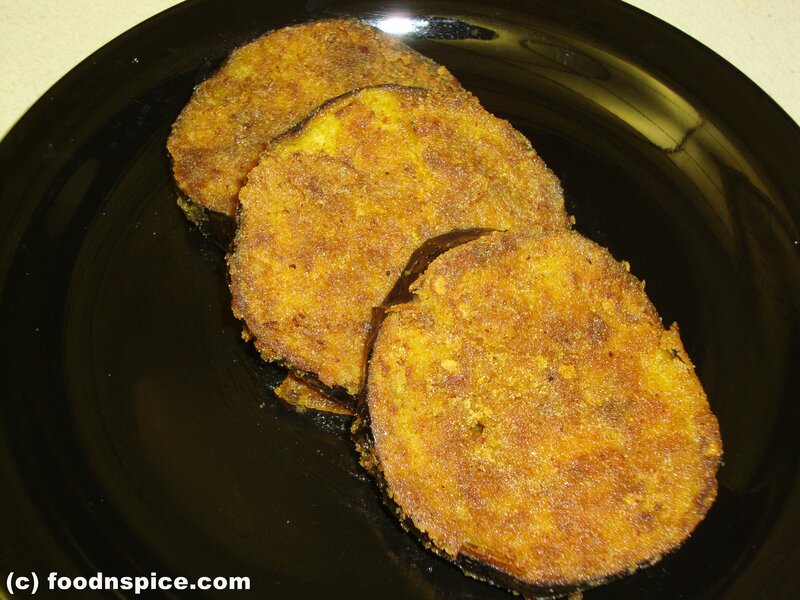 Brinjal suits this recipe well, as it absorbs all the flavor. I guess, you can try it with potatoes.